One feels an overwhelming desire to reach out and touch the heavily decorated and fiercely fibrous pages that crop up on Allie Alvis' bibliographic Instagram feed. Each post offers an educational and mostly fascinating peek inside the intriguing world of antique paper, embellished bindings and calligraphic celebrations. Alvis 'Boomerangs' gold leaf manuscripts from the 14th century, reveals hidden fore edge paintings, and points out creative markers left behind by medieval scribes. It's through her Instagram (@book_historia) that the she shares excerpts and close-ups from the Cullman Library and other libraries around the globe. The self-titled, "Pink-haired book historian" is a Reference Librarian for the Joseph F. Cullman 3rd Library of Natural History at the Smithsonian National Museum of Natural History - and it looks like fun. 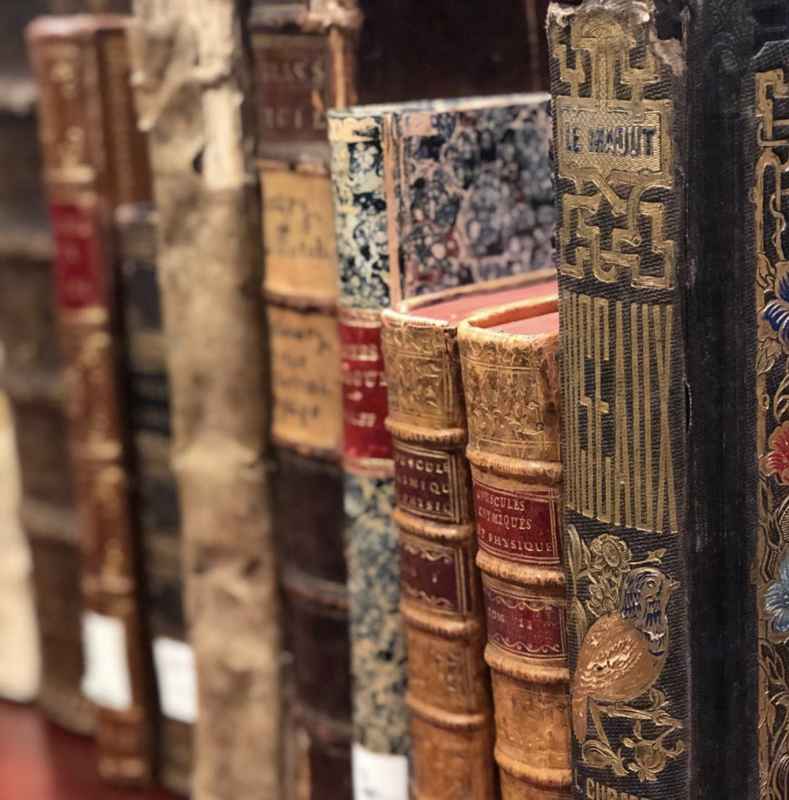 After cruising her book-filled Instagram, we had to find out more about life amidst the Smithsonian's extraordinary collection of rare books. Image: @silibraries - "International Crustacean Congress at the Cullman Library"
BSQ: As a Reference Librarian, you’re often tasked with aiding researchers in finding rare pieces of information. Have you ever been a part of or witnessed any exciting new discoveries? AA: It seems like every time someone comes into the library I witness a new discovery! As we are located in the Smithsonian National Museum of Natural History, a great deal of the research we help out with has to do with taxonomy: the naming and classification of species. This kind of work is cumulative, so scientists have to go back into the literature to find the earliest citation of the animal or plant they’re trying to identify, which is sometimes hundreds of years old. It’s always thrilling when a scientist confirms that yes, indeed, the citation they’re looking for DOES appear in such-and-such 18th century book, or when they find the creature they’re working on in an old illustration. One of my favorite bits of research I helped out with was comparing specimens of bluebirds to one of our copies of Robert Ridgway’s 1886 A Nomenclature of Colors for Naturalists, in order to make sure there weren’t any misattributed birds in the collection! Image: @book_hisoria "“The Florist’s Journal and Gardener’s Record” (1846-48)"
BSQ: The Cullman Library has over 10,000 volumes published before 1840 on natural sciences. What level of care goes into the handling and conservation of these books? AA: As our books are already so old, we want to make sure they survive in a useable state to be studied by future generations. Therefore, many levels of care go into our collection! Physically, our books are kept in a temperature and humidity controlled vault, ensuring that fluctuations in the indoor and outdoor environment do not have an adverse effect on them. The large majority of our collection incorporates organic elements (such as leather or vellum bindings, and cotton rag or wood pulp paper) that are very susceptible to changes, and may actually expand and contract under different conditions, meaning that the books may be damaged even just sitting on the shelf! We do have a book conservation lab, staffed with three rare book conservators and two technicians, that gives our collections items TLC as needed. We want all of our books to be able to be used, so it’s important that they don’t fall apart in our users’ hands! Our conservators also review all of our items for structural integrity before they are digitized. Another pre-digitization activity is cataloging. In order to be used, our books first need to be found! We have a great staff of two rare book catalogers who make sure the records for our items are more substantial than a simple author, title, date, in order to facilitate greater accessibility. Finally, a lot of thought also goes into rare book handling in our reading room. We use foam wedge supports for all of our books that are referenced to ensure that they are not over-opened or sit flat, both activities that can cause damage. Something that surprises some people is that we don’t make our readers wear cotton gloves! Gloves actually reduce manual tactility and dexterity, and have the potential to cause more hurt than help. Instead, we advise people to ensure that they have clean, dry hands before entering the reading room. 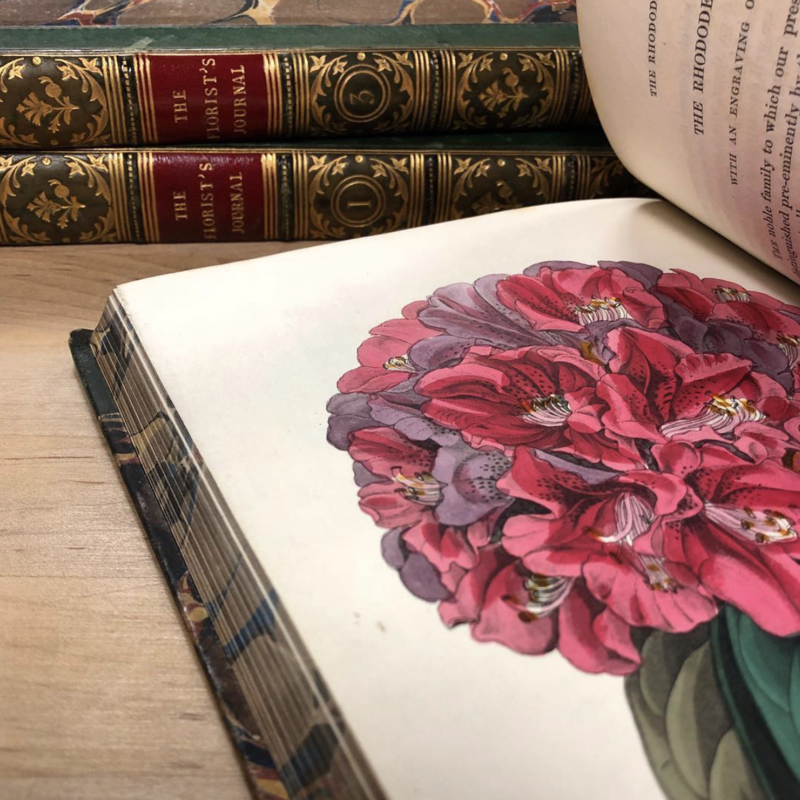 Image: @book_historia "...some fine spines from the shelves of @silibraries"
BSQ: Specific books that deal in topics such as botany and ornithology are synonymous with containing highly detailed illustrations. Are their any shining examples or favorites of yours at the Cullman? AA: Oh, too many to choose from! I’m particularly fond of the works of 19th century English ornithologist John Gould. Working with a talented team of artists that included his wife Elizabeth, he produced many fabulous large-format books about the birds of different parts of the world. I love how the illustrations in his works are so dynamic and lively, not just static specimens on a page. And because you also mentioned botany, another favorite of mine is Jacquin’s 1797-1804 Plantarum rariorum horti caesarei Schoenbrunnensis, depicting plants in the garden of the Schoenbrunn Palace in Austria. Like Gould’s works, Jacquin’s book is backed up by detailed taxonomy, making it not just a delight to look at, but very useful to scientists and scholars. BSQ: James Smithson, the founding donor of the Smithsonian Institution, established a solid reputation as a chemist and mineralogist. Does the Cullman Library house any works authored by Mr. Smithson himself? AA: We do! We have a number of copies of his articles A Chemical Analysis of Some Calamines (1803) and On the Composition of Zeolite (1811). We also have a manuscript letter that he wrote from France during the French Revolution to a colleague! Although we don’t have a large amount of his writing, we hold his whole library, which was part of his original bequest that became the Smithsonian Institution. The library itself contains numerous marginal notes made by Smithson himself, adding his thoughts to the text. 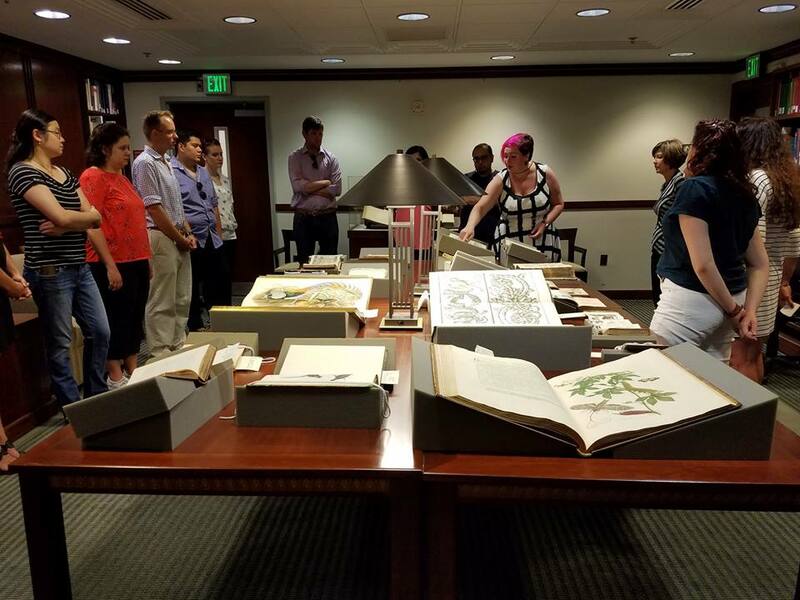 BSQ: Your Instagram handle @book_historia gives people an inside look at the @silibraries special collections. Did you ever think you’d be engaging with an audience of 22.3k followers (and counting)!? AA: I really didn’t!! If you go back far enough in my Instagram history, it’s just food, selfies, and cats. It wasn’t until I started working at an antiquarian bookshop during my first masters’ degree that I started peppering my “normal” posts with pictures of old books. A few special collections libraries and librarians followed me and we started a dialogue, and soon I was posting nothing BUT books! I really enjoy using my social media presence to educate, it’s a much more personal way of encouraging people to use special collections. And I’m free to make all the bad puns I want! Image: @book_historia " Priézac’s 1650 “Histoire des Elephants,” from @silibraries"
BSQ: The rare, antique books you handle on a daily basis come in all shapes and sizes. Are there any favorite miniatures and monsters hiding on shelves? AA: A few weeks ago I actually dropped a full-size facsimile of Audubon’s Birds of America on my thumb, so I can confirm that we have some “absolute units” in our stacks! The draw of large format books is, of course, that you have room to depict specimens at (or close to) their life size. I’m very interested in the history of bookbinding, so I must admit to judging books by their covers sometimes! One such item is a work by Ulisse Aldrovandi, his 1602 De Animalibus Insectis. It’s large enough to be put onto our oversize shelves although it’s not huge; however, the binding has several interesting things about it, not least of which is the fact that it’s painted with a pigment that contains arsenic! You can read more about it on the Smithsonian Libraries blog here. 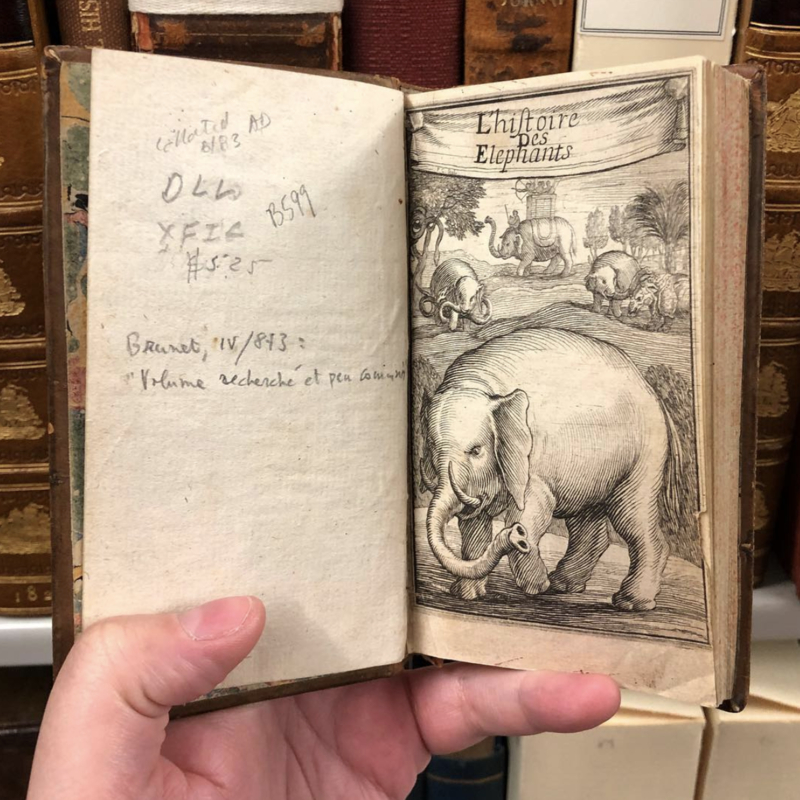 We’re unfortunately kind of short on miniature books (haha…) here in the Cullman, although we do have an ironically tiny book about elephants! 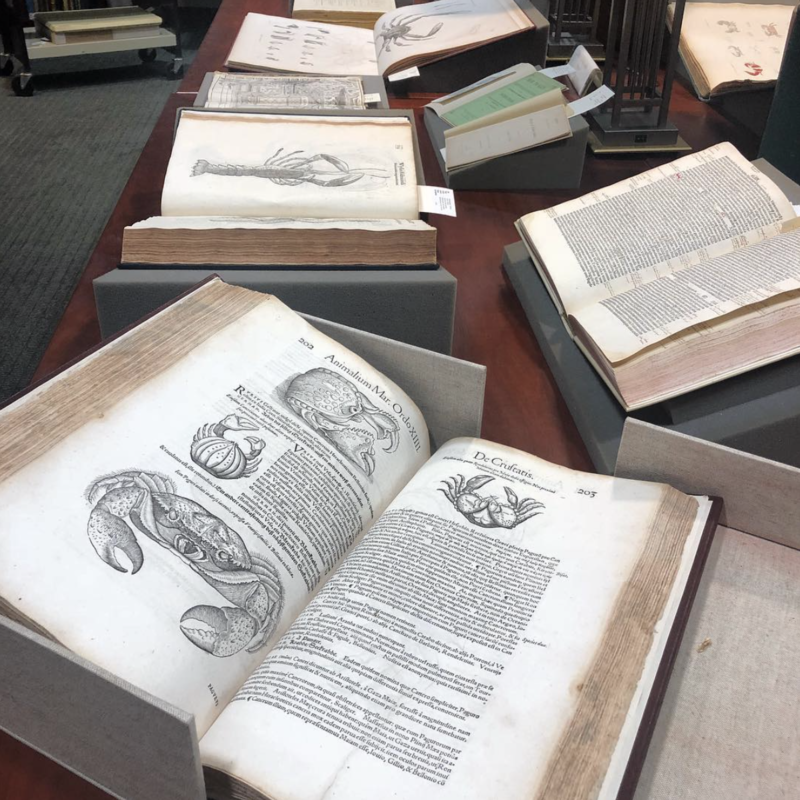 BSQ: Since Special Collections Department libraries are only available to Smithsonian curators, researchers, as well as qualified scholars, where is the best place for rare book lovers to view your digital archives? AA: This is actually a bit of a misconception: our collections are intended to be used by ANYONE with a research interest! This means artists, gardeners, fiction writers, pigeon fanciers… anyone! We just ask that you contact us before you come in, so that we can introduce you to our catalog and you can request what you need. But if you can’t come in physically, we do have a robust digitization program! Most of what we digitize ends up in the Biodiversity Heritage Library (BHL), a worldwide consortium of libraries that is based at the Smithsonian. BHL functions as an open-access digital library for biodiversity literature and archives, and aims to digitize ALL taxonomic literature one day! The Smithsonian Libraries image gallery also holds a selection of images from around the collection. BSQ: What excites you most about working at the Cullman Library? AA: Is it cheating to say everything? Really though, from working with researchers near and far to caring for the physical wellbeing of the collection, it all feels very rewarding. I suppose if I had to pick a FAVORITE thing, it's sharing the collection with people who might not think they are “allowed” to use old books for research! Doing this through tours, lectures, and social media really encourages people to visit the collection physically or online and make discoveries of their own. We always learn so much from our researchers! 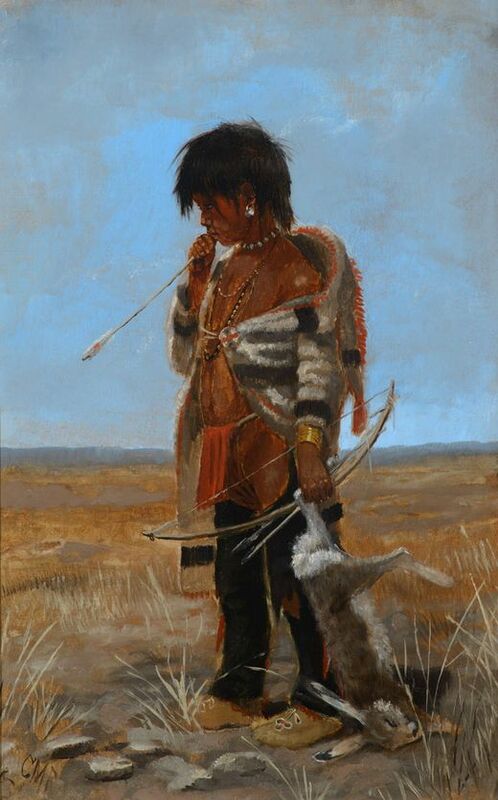 Be on the lookout for Bidsquare's upcoming partnership with Rago Auctions and the Smithsonian Institution for their Smithsonian Visionary Artists Benefit Auction, beginning on April 24 and running until May 20th. The sale will feature items created by past and present Smithsonian Visionary Artists, sold to benefit the Smithsonian Institution! "Alexandra Alvis is a book historian and bibliophile who has found her niche in the Cullman Library. As a Reference Librarian, she interfaces with researchers both in the reading room and online, in order to assist them with whatever topic they may be pursuing. She manages the movement of Cullman collection items from the vault to the reading roomand beyond to exhibition, digitization, and conservation. She regularly shares her bibliographic experiences on Instagram (@book_historia) and Twitter (@book_historia), and writes longer-form articles on interesting aspects of book history on her blog (book-historia.tumblr.com). 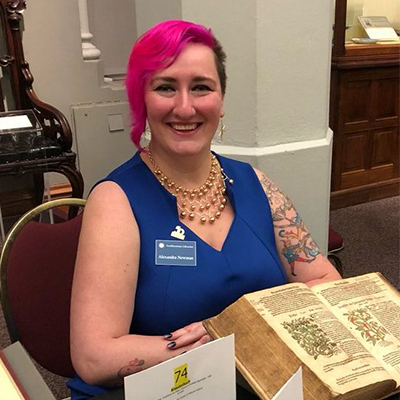 Alexandra received her undergraduate degree with honors from the University of Kansas in Linguistics, the field which first put her into contact with rare books and materials. From there, she attended the University of Edinburgh, earning an MSc with merit in Material Culture and the History of the Book, focusing on the rebinding and conservation of medieval illuminated manuscripts. Deciding that one Scottish master's degree was not enough, she also attended the University of Glasgow, this time earning an MSc with merit in Information Management and Digital Preservation. Her thesis for her second MSc laid the groundwork for a wider study of the influence of the English bindery of Douglas Cockerell and Son, a project that she is actively pursuing."